With the unique idea of developing home cleaning robots, iRobots has made life expedient for the working class Americans as well as global citizens who find themselves conforming to the restrictions of time. A prodigy of the trio of the IT geniuses and graduates of Massachusetts Institute of Technology, Rodney Brooks, Helen Greiner, and Colin Angle, iRobots Corporation is the vertex of American Advanced Technology, which was established back in the 1990s and has only been en-route to evident success. 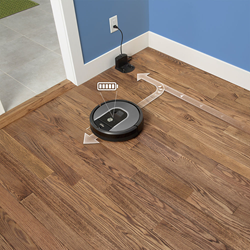 For years now, iRobot has remained engaged in developing unique, multi-tasking robots that assist individuals in their chores. But they ventured into more complicated robotic developments when they developed military specialist robots to aid in the progress of America’s defense system. Fascinated by the company’s distinctive technological development and intrigued by their current endeavors, we happened to speak to one of Techrevel’s representatives about what is happening indoors. We concluded that the vacuum technology has progressed to far more advanced levels and today, not only is the robot just a few taps away, it also carries the intelligence to clean different types of spots with different strategies.